Kansas City is the largest city in the state of Missouri which encompasses over 300 square miles in parts of Jackson, Clay, Cass, and Platte counties. It has a population of around 460,000 residents and is one of the two county seats of Jackson county. This is the main city of the metropolitan area that contains more than two million people on the Missouri-Kansas border. KC Pro services foundation repair Kansas City MO area to continue keeping homes safe and sturdy. In 1838, Kansas City was founded as the Town of Kansas. During the Civil War there were several battles at the location, including Battle of Westport. Kansas City is known for its contributions to the music styles of jazz and blues and also to the Kansas City-style barbecue. The city was also selected by Forbes magazine as one of America’s best downtown for its rich culture in arts, numerous fountains, upscale shopping and various local cuisine. Kansas City is bowl-shaped and surrounded to the north and south by limestone and bedrock cliffs that were carved by glaciers in the past. Much of urban Kansas City sits atop bluffs overlooking the rivers and river bottom areas. When the glaciers melted and drained both the Kansas and Missouri rivers cut wide valleys into the terrain. For the residents in Kansas City there are soil-related issues that leads to foundation issues. 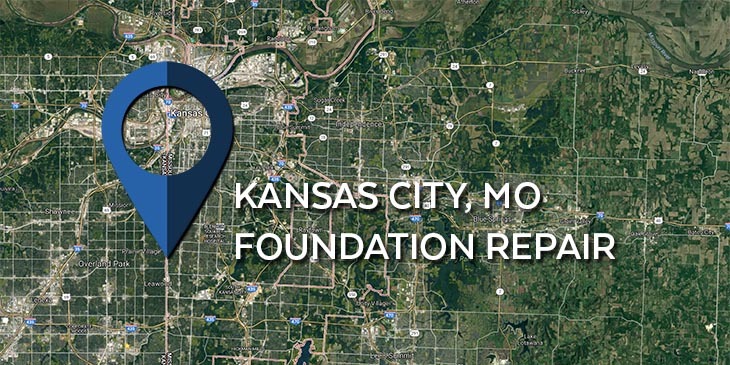 If you need foundation repair Kansas City MO or the surrounding areas KC Pro can solve your problems. Soil problems can produce stress that can cause cracks and damage your foundation and overall structure. Are your basement walls starting to lean or bow? Do you have cracks in your foundation? Overtime, your home can suffer from foundation problems due to soil related issues. This can cause leaning walls or chimneys in your home. When this starts to occur it is necessary to get foundation repair Kansas City MO to keep your home safe for you and your family. It is recommended to have a professional come and take a look at your foundation problems to make sure that it is repaired quickly and permanently. At KC Pro we can repair your foundation with ECP repair solutions. Our repair solutions are underpinning and wall restraints. We use underpinning to correct imbalances within your home’s structure. We offer various types of piers to stabilize a structure’s load bearing walls. They include resistance piers, helical piers, new construction piers, concrete piers, and slab piers. At KC Pro we will use the best repair system to support your home. We are your true foundation repair Kansas City MO team. Not only do we offer underpinning, we use wall restraints to fix your bowing or bending walls. We offer four types of wall restraint solutions that include tieback anchors, steel I-beams, wall plate anchors, and carbon fiber strips. We can repair your foundation today. If you have any questions or concerns about the foundation of your home, call us today for a free estimate. We can be your foundation repair Kansas City MO service provider. Along with foundation repair, we also take care of basement waterproofing for customers throughout Kansas City, MO. Water can be a severe threat to any structure. Basement leakage is often times a side effect of home settlement. Your foundation may begin to crack when your home sinks into the ground, these cracks become an open pathway for water to enter your basement. You’ll want to find a reliable waterproofing contractor who will take care of you and your home. Your home is your biggest investment, therefor, you will want to do all that you can to protect it. We are local, Kansas City professionals who can provide you with interior and exterior waterproofing systems, including sump pumps and vapor barriers. We only hire the most skilled and qualified employees. We can guarantee that your job will be done in a quick, safe, and efficient manner. We have many waterproofing services that may assist you when your home is in need of basement waterproofing. Don’t hesitate to have us come in and take care of your basement needs. We are glad to be of service. Contact us today to solve your foundation repair problems.